The Apple iPhone 6s has arrived with a splash, and it’s one of the biggest S cycle upgrades for the series. It enters a hugely competitive market, though, and one of its main rivals from the get-go will be Samsung’s Galaxy S6. Both are premium, stylish phones offering the best that Apple and Samsung have got, but the difference between them is also fundamental: it’s a clash of two ecosystems, the more tightly-controlled iOS 9 on the iPhone 6s against the openness of Android. However, it’s also about actual real-life features, and that’s where Apple has stepped up its game hugely with some clever additions that are built in a very convenient and deep way in the system. In many aspects, this difference makes it hard to do a direct comparison of their performance power and try to objectively measure their capabilities, but in order to choose the better one, it’s worth taking a deeper look at their specs. Apple’s iPhone 6s is - by all visible clues - the same iPhone as last year’s iPhone 6, but that’s hardly a bad thing. Quite the opposite: the extremely thin body and rounded edges make the iPhone 6s very comfortable to hold and have in your pocket. And when it comes to materials, the solid aluminum construction makes the iPhone 6s feel like a device that can withstand the test of times without showing much wear and tear. The elegant new ‘rose gold’ color option is also another neat unique choice. The Samsung Galaxy S6, on its part, is also a premium device with a sturdy metal frame and glass on both the front and the back. It features flat, vertical edges and is a bit more blocky, which makes it a bit less comfortable to hold, but it’s also a very thin phone that looks every bit as good as Apple’s creation. The larger screen on the Galaxy S6 dictates its larger physical footprint: it’s both taller and wider, but the difference is not all that huge and both phones are fairly comfortable when it comes to single-handed use. In terms of buttons, both devices feature a physical home key with a fingerprint scanner built in it. The other physical keys are located similarly: the volume rocker on the left, and the power key on the right, and all are clicky, responsive and made of solid aluminum. After many iterations, Samsung seems to have mastered the art of AMOLED displays, and we are impressed with the overall quality of the 5.1-inch Super AMOLED panel on the Galaxy S6 with its Quad HD (1440 x 2560 pixel) resolution. The iPhone 6s, on the other hand, sticks to the good old ‘Retina’ formula with an IPS LCD display - it’s a 4.7-inch screen with a resolution of 750 x 1334 pixels. Naturally, this gives the Galaxy S6 the edge when it comes to sharpness: it has a pixel density of 577ppi, while the iPhone 6 has 326ppi. This difference is noticeable when you hold the phone closer, but at regular viewing distances you won’t find much of pixelization, as both appear sharp. You’ve all heard that, though: Apple has gone over the traditional thinking here with a brand new feature it calls 3D Touch. 3D touch does exactly what its name suggests: adds a third dimension to your traditional two-planar interaction with screens and it can be used on any and all first party apps to quickly access their most popular features: 3d touch your phone book to quickly call your favorite contacts, 3D touch the camera to jump straight into taking a selfie, 3d touch Maps to get driving directions home, and so on. We’ve long been hearing about the end of the spec wars and 3D Touch is a feature that demonstrates just that in many ways: while Samsung continues pushing screen resolution to extremely high levels where the actually perceived improvement in sharpness is minimal, Apple brings a feature that is totally out of the spec wars game. It’d be interesting to see how Samsung reacts to that. The iPhone 6s, naturally, comes with iOS 9, the latest and most refined version of Apple’s platform, while the Galaxy S6 features TouchWiz-flavored Android 5.1 Lollipop. It’s interesting to see how these two platforms have developed over time. You all know the basic differences between the two on the smartphone side of things, but we find it equally important that Apple is actually strengthening vertical integration in so many ways. The iPhone 6s works with the Apple Watch, works with the Macbook, works with Apple TV, works with CarPlay, and so on, and so on. Android is also gunning for a similar effect, but the integration there feels much less natural and rather lofty. It also feels like Apple still has the vastly superior ecosystem: Apple’s first-party apps are running smoothly as is iOS 9 in general, while Samsung seems to have a less comprehensive portfolio of apps on the Galaxy S6: it lacks the recently more and more powerful Apple Maps, it lacks the diverse and full-featured functionality of Apple’s Health hub, and it also offers little in ways of curated content. This year, both Apple and Samsung have bet the house on their own chips: Apple has now traditionally unveiled its new Apple A9 system chip with custom cores designed by the company, while Samsung uses its home-grown Exynos 7420 system chip on the Galaxy S6. Of course, there is the never-ending discussion about the amount of RAM as well. The iPhone 6s features an undisclosed amount of the stuff (hopefully, maybe 2GB), while the Galaxy S6 has 3GB of RAM, and this should theoretically give it an advantage in multitasking as more apps can store information on this high-speed memory, so that there is no need to go to the much slower internal storage. Unfortunately, we’ve seen that Samsung has had issues with proper memory management and apps reload much faster than they should, so it’s up for debate how much of a real-world advantage does the physical presence of more RAM brings. The much less controversial issue is with internal storage: Samsung pulled off an Apple early this year when it said that the Galaxy S6 will not support expandable storage. The iPhone 6s also lacks a microSD card for memory expansion, so that you’re left only with the built-in storage. We should say that this is still much more of an issue for the iPhone - it comes with a very claustrophobic 16GB of internal storage in the base version, while the Galaxy S6 has a much more manageable 32GB of storage even in the base model. That actually might be the iPhone 6s’ weakest side: the most popular base model now seems to be very limited with its small amount of internal storage. With smartphones reaching a point of maturity and feature-parity in many aspects, camera quality remains one of the few important areas where quality can make a huge difference. Apple has for a while been considered to have some of the best cameras on a phone, but Samsung has really stepped up its game with the Galaxy S6. With the iPhone 6s, Apple answers that challenge: it upgrades to a 12-megapixel main camera capable of recording 4K video and a 5-megapixel selfie shooter. The Galaxy S6, on its part, has a 16-megapixel rear camera (with 4K video support), a 5-megapixel selfie cam. As much as specs matter, though, when we speak about cameras the sheer number of megapixels means very little: it is the processing and interpretation of images, as well as focusing speeds and convenience of use that make a difference. And it’s not even that - it’s about features and convenience of use. Samsung has made one big step in that direction by cleaning its camera app of clutter and introducing the neat Quick Launch shortcut, where you double click the home button to go straight to the camera from any place. Apple, however, brought the big guns with a few disarming, well thought out and very well integrated new camera features. First and foremost, that is Live Photos. It’s been done before - you push the shutter key to take a picture and the iPhone also captures a short video that is then saved to your camera roll and thus your photos come to live. Problem is: it has never been done right - never integrated so seamlessly and tightly in the gallery and camera apps, never done with a single button that you can just push and have it automatically record those videos with every firing of the shutter. Apple has bundled in a slightly smaller battery on the iPhone 6s, but the new, more precise manufacturing node has brought efficiencies, and overall battery life on the 6s is officially perfectly on par with the iPhone 6. The Galaxy S6, on the other hand, has a larger battery pack, but also a more energy-hungry display. We’re yet to test the two to determine which of them has the overall better battery life, though, so do stay tuned for that. 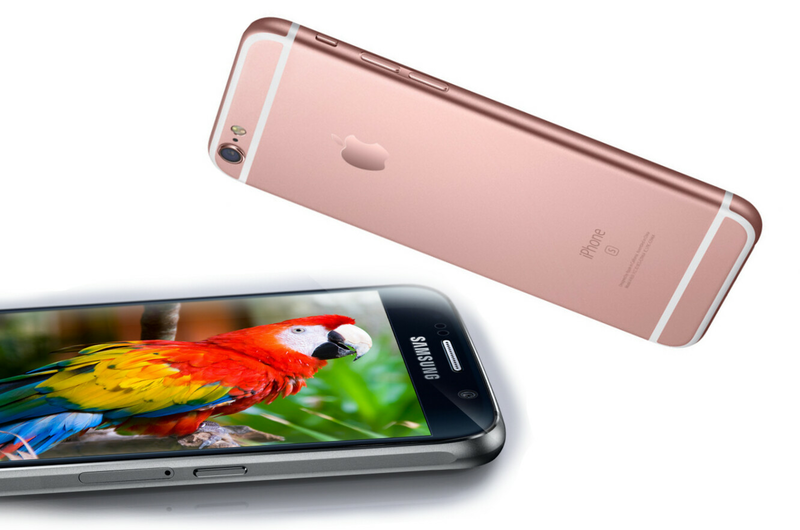 All in all, with the iPhone 6s and Galaxy S6 we’re looking at the two of the best phones money can buy. The iPhone 6s makes a convincing case for itself: it’s an all-around upgrade that tackles almost every weakness (if it weren’t for 16GB of internal storage…) of the 6, while throwing in a couple of nice surprises. 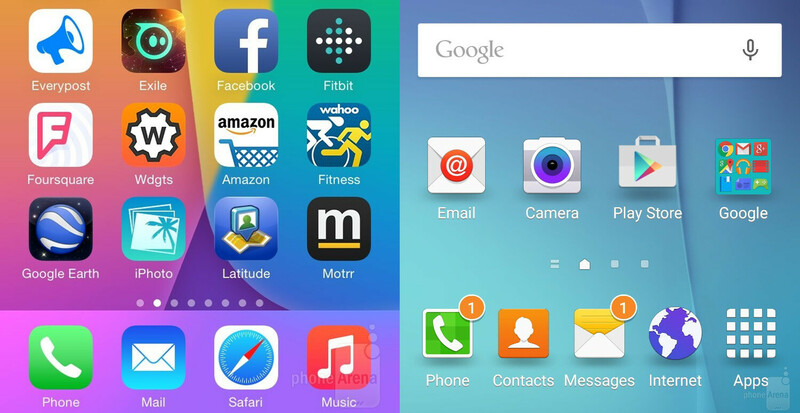 The Galaxy S6 has never looked so weak in terms of features and lifehacks as in this comparison with the new iPhone 6s. As much as we like the coolness factor of the iPhone 6s features, though, it’s hard to see anything except 3D Touch as a true game-changer. And with the much cheaper price of the Galaxy S6 and its similarly great camera, this battle is going to be heated. i haven't really done an in-depth reading of this and i am perfectly ambivalent between android and ios. i think they are both great. i am looking forward to samsung and lg's answer to this phone. they will probably both be beautiful. i am just looking forward to all the android fan people coming up with logical rollercoasters about how this is just the itoy or the ifail and how it is pathetic and for children and blah blah blah using the same arguments they have used for every iteration of this phone. the amount of illogic that gets passed around is always so amusing. Samsung already has an answer. The latest iPhone can't even top the South released in the same year. The St came out in Spring, so Apple release afterwards and releases less. Why? They had 8MP since the 4S. They had 1.2MP since that time too. With all this money, why not drop a 40MP one. I mean so.eone with less money did and the phone is still less than and iPhone. Samsung is ripping us off too in certain ways, they all do. But the iPhone should be better. after seeing this beautiful phone and after how samsung treated note 4 owners all i can say is RIP sams**t.
That phone looks no better than iphone 6 except you are in to rose gold color. I think both phones are well and good, considering the price I will choose S6, for same price, it's a hard question, might be 6S. But for large screen, I would never get iphone 6S plus, there is no better alternative than note, unless microsoft comes up with something great this year. I am not apple hater or samsung fanboy, I own a big mix of devices a windows 8 laptop, macbook, ipad air 2, nvidia shield tablet and a note 5. Just use your brain, calling any company sams**t or just not make you sound smart. How did Samsung treat me? They sold me what was at the time the best large screen phone on the market. It's worked fantastically ever since. Beautiful? Enjoy all those bezels. Yes, Apple said the M9 co-processor allows for always on Siri. You do know that the peeping is copied from the air view on the S4, right? No it won't. We'll adjust to it, and it'll become the norm. At some point training wheels come off a bike right...riiiiiiight. PA needs to do a comparison between Sony Z5 Compact against iPhone 6S, practically same size screen but smaller overall and bigger battery. Not everyone has nova launcher, but every 6S has 3D touch backed right in, and you are not forced to use it. Killer game changing feature. Anyone with android phone can install nova launcher jedii. Those that want it always have had access to it on the play store. Sure this force touch brings it to a wider audience by default, but no need for PhoneArena sucking so hard on Apple's d!ck pretending like it brings anything new. I never liked nova that much, but I guess it's too overwhelming for me, all the options. I like and hate some things from google now, some from touchwiz and some from nova. I'm not a fanboy or anything but I feel like this article is really bias towards Apple and the choice of words when talking about Android have a negative connotation. Please be fair, PA. When you guys review this iPhone you really need to be hard about that 16GB entry level model. If the media is not hard on Apple they will just release a 16GB iPhone 7 next year. Greed is the only excuse here. Every thing else I'm fine with including how useless 3d touch is. And why did u come up with the idea their S is significantly different from the regular ones? Lol this article is hilarious. Saying the display is only a little sharper when the GS6 display, spits, s**ts, and stomps on that crap iPhone 6 display. The size difference alone is huge. Lol Victor H, what joke. For me it's front of Edge (without buttons) and back of Note 5. Agree on the rest. Also i could buy 5.2-5.7 if bezels would be really small. I just don't need QHD screen, but I can live with it.